Bad Reputation is the unexpurgated story of Joan Jett, the single most exciting rocker of the American 1980s, one of the biggest-selling acts of the age, and one of punk rock’s most valued elder statespeeps. Through its pages, a welter of exclusive interviews and observations paint what might well be the last great tale of rock hedonism, but one that comes with a twist in its tail. The rockers are women, the groupies are guys. It could have been the plot line for a movie or even a sitcom, but the Runaways, Jett’s first band, made it happen, and Jett made it last. The first serious female rocker of the 1980s, Jett became the template for everyone that followed. But unlike so many of her peers and counterparts, she never lost her credibility, never sold out, and never gave up. And she has backed her reputation up with genuine star power, following the chart-topping “I Love Rock ‘n’ Roll” – one of the most played ’80s anthems of all time – with “Crimson and Clover,” “Do You Wanna Touch Me,” and “I Hate Myself for Loving You” before the decade ended. And, while the 1990s saw Jett purposefully step away from the spotlight, she remained, and remains, America’s number one Queen of Noise. 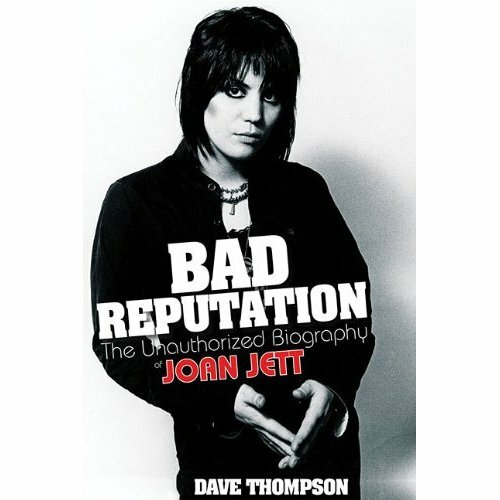 If the phrase “unauthorised biography” largely conjures up images of a superficial cut’n’paste hack job, then Dave Thompson’s excellent study of Joan Jett is at the other end of the spectrum: the labour of love. Part of Jett’s story is now pretty well-known, thanks to the recent Runaways movie, but this book is a reminder of the fact that, even when The Runaways and their sporadically excellent discography was all but forgotten, Joan Jett herself was, if not a household name, at least an established artist. Since the dissolution of the band, Jett’s career has been one of highs and lows. As Bad Reputation documents, her consistency means that, when fashion is receptive to a punk-ish vision of rock’n’roll, without its sometimes overblown aspects, Joan Jett tends to do well; when artificiality or stadium pomposity are in vogue, she suffers accordingly. If there’s a down side to Thompson’s stylish, passionate book it’s perhaps that he tends to exaggerate Jett’s importance. On the other hand, his enthusiasm is such that he may just sway you. Even as she and Laguna worked towards the Evil Stig album, work on Jett’s own next album was already underway. Falling in with songwriter Jim Vallance, they took over his Armoury Studios in Vancouver, recruited producer Bob Rock and began recording fresh material with him. She was also reunited with Paul Westerberg, whose song “Androgynous” (from the replacements’ Let It Be album) had recently moved into the Blackhearts’ live set, and was one of the first songs pinned down for the next album. The accompanying video was just as exciting. With Jett nursing a shoulder she had injured the previous evening in a bicycling accident, but biting back the pain to celebrate the appearance in the shoot of Joey Ramone, it also allowed Jett to unveil her new hairstyle to the cameras, short, blonde and spiky replacing the familiar lush darkness. It seemed somehow appropriate. Meanwhile, what about that new Joan Jett and the Blackhearts album? Almost two years had elapsed since it was first formulated, at Armoury Studios in Vancouver, and it was, apparently, still gestating. But it was also snared within a succession of bear traps, only the most easily resolved of which had anything to do with Jett and the band. Now the band was working with Ted Templeman, a veteran whose resume stretched back to the Doobie Brothers and Van Morrison in 1971, then moved on to the likes of Van Halen, Aerosmith, the Bullet Boys, Damn Yankees and Cheap Trick. In fact, she would have a lot more time than she thought. Having already scrapped the Bob Rock sessions, the Templeman recordings, too, seemed doomed to remain archived. September 1997 came and went with no sign of the album; in its place, Blackheart Records released a hits collection, Fit To Be Tied, with bonus track-stuffed reissues forBad Reputation and I Love Rock’n’Roll, to follow. And eighteen months later, Jett was still awaiting a berth on the new release sheets, and growing increasingly frustrated by the delays. There were, he said, some twenty-five songs in the can, drawn from both the Rock and the Templeman sessions, and the album would certainly be created from that stockpile. In the meantime, the gap would be plugged with yet another compilation. Fetish was, he said, an idea that they’d been batting around for a while, and there is little doubt that it was the protracted drama over the “real” new album that pushed them to release what amounted to another compilation. But that wasn’t the only reason. Themed compilation albums were an unusual idea, and it was one that Laguna wanted to act upon before anybody else came up with the same notion – particularly as there was also a sense that the Blackhearts had inadvertently passed some very good ideas onto other Warners acts in the past, and they had no intention of that happening again. Fetish would be released in June 1999, five long years after Pure and Simple, and its X-rated subject matter certainly drew in a few curious ears that might not otherwise have listened to a Joan Jett album. Which certainly made a pleasant change from the other Jett-related scuttlebutt that was hanging from the grapevine that season… the imminent Runaways reunion. I have questions about Joan Jett.